As any Captain will tell you, the Captain’s primary mission is to safely operate his or her vessel to protect the well-being of everyone aboard as well as others sharing the water with the vessel. Here at RentalBoat.com, we promote the safe and sound operation of our rental boats so that you and your party can enjoy a fantastic day out on the water. When you rent a boat from us at RentalBoat.com, we will review the vessel’s operation, features and safety equipment before you board the vessel. We will ensure that you are familiar with the measures you must take to safely maintain and operate the vessel once you leave the dock. Understand How the Vessel Operates. Pay close attention as our representative explains and demonstrates how to operate the vessel. Be sure to note how to connect the motor shut-off cord/lanyard before attempting to start the motor. Also be sure to check near the motor to ensure that the propeller is in the water and that nobody is swimming near the propeller. Many boaters find themselves in a situation where they need to start to motor to avoid danger but forget to connect the shut-off cord/lanyard. Where are the Life Jackets? Life Jackets save lives. Common sense tells us that if we are forced into the water, life jackets give us a much better chance at survival and rescue. Whenever you step foot aboard a vessel, you should locate where the life jackets are stored and ensure that there is a life jacket for each person aboard. 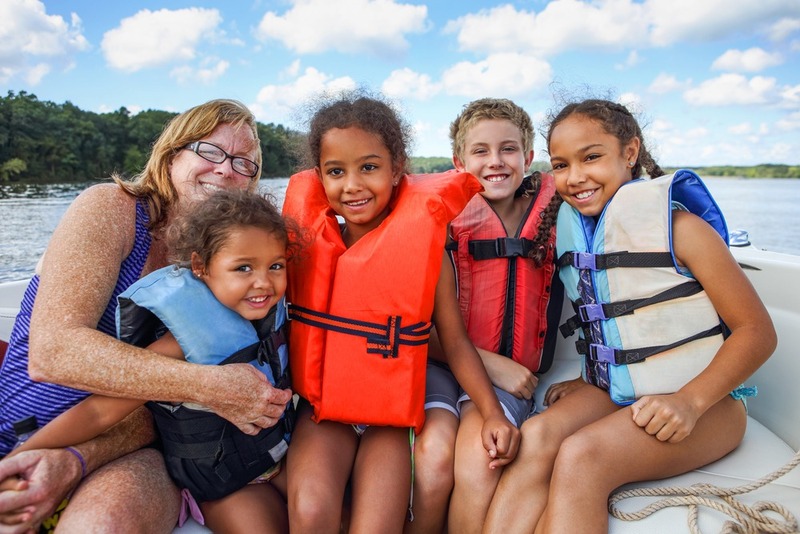 Many states require that a life jacket be worn when a vessel is underway. If you have small children aboard, be sure to have them wear a life jacket at all times. Where is the Other Safety Equipment? Be sure to locate where safety equipment such as VHF radio, flares, horn, whistle, etc. are stored so that you can access them in case of emergency. Keep in mind that things happen fast on the water and you will need to act quickly should the vessel begin sinking or face some other danger. Operate in a Safe Manner. Our rental boats are powerful, maneuverable machines. They need to be respected and operated accordingly. The faster you go, the less time you have to react on the water to avoid danger. Furthermore, a boat does not have brakes like a car or truck. It does not stop on a dime and requires room to come to a stop. Keep these in mind as you operate your vessel. Like operating a vehicle on land, you need to be aware of all vessels around and near yours so that you can be ready to act should the other operators not see you are avoid you. Passengers. While the vessel is underway, passengers should be seated or standing near the vessel’s center or holding onto the console so as not to get thrown from the vessel when turning or encountering boat wakes. Also, make sure that your passengers avoid jumping or diving off of the vessel while underway as this can lead to injury. Obey Laws of Navigation. The fact that you are renting a boat does not relieve you or your obligation to observe all navigation laws. The U.S. Coast Guard created laws of navigation to safeguard all persons and vessels on the water. Be sure to pay particular attention to No Wake Zones as local authorities strictly enforce these areas. When you are on the water operating a RentalBoat.com vessel, you can ALWAYS reach out to us via VHF radio or mobile phone to ask us for help. We’re here for YOU to ensure that you have a fantastic time on the water and enjoy the beauty and weather that made boating in South Florida famous. Give us a call to rent your boat now.